The long in the making Vaalu starring Simbu and Hansika had its second trailer released in the recent past, and has generated a lot of positive responses. 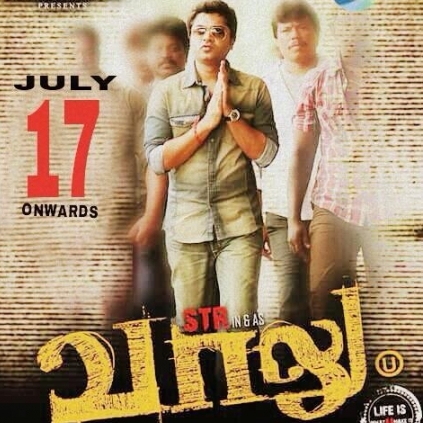 While awaiting the release date (July 17), team Vaalu has different reasons to feel happy. Director Vijay Chandar, art-director Lalgudi Ilayaraja and editor T S Suresh have been celebrating their birthdays on three consecutive days, Monday (June 29), Tuesday (June 30) and Wednesday (today, July 1) respectively. The last song Thaarumaaru is being shot now with Simbu and Hansika, as reported earlier. Having struggled so hard to complete the film, these birthdays will be really special for the team. We wish all these technicians a very happy birthday. People looking for online information on Hansika, Lalgudi Ilayaraja, Simbu, T S Suresh, Vaalu, Vijay Chandar will find this news story useful.